Hey! We have a new call for art! Finally! 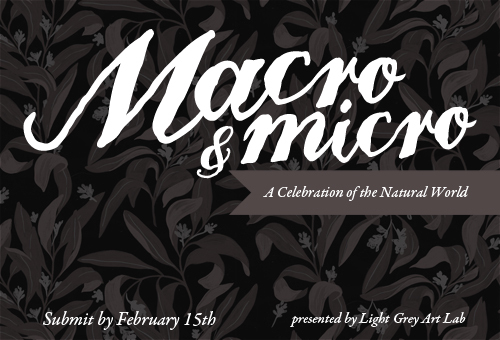 EDIT: Thanks to everyone that submitted links to our Macro & Micro call for art! The call for art is now closed! We'll be announcing the participants later tonight! Thanks so much for everyone's support and interest! There are approximately 3800 known minerals in the earth's crust, an estimated 953 thousand known animal species, and another 215 thousand plant species (not to mention another vast collection of fungi, protozoa and chromista), and the millions of things we haven't discovered yet. We read National Geographic to hear about how twenty-five percent of the life on Earth is beneath the oceans. Tectonic plates creak and crush against each other, the balance of the hydrologic cycle builds and destroys landscapes, and the wind patterns bring unexpected gifts or curses. We are holding a call for art celebrating the intricacies of our earth and all of it's spaces, relationships, weather, surprises and the intricacies of life and the lack-of on a macroscopic or microscopic level. We are looking for everything from scientific illustrations, to airy, open landscapes. Creatures of modern day, to those from days past. Catalogues of fruit, to a traveler's journal of an antarctic exploration. What does a chinchilla skeleton look like? Symbiotic relationships may inspire you. Adaptations and exceptions or compare and contrast the different pieces of our earth. Editorial images, celebratory, and researched themes are appreciated. We're looking for a collection of artists to show us the most awe-inspiring natural phenomena you can think of and we shall display it proudly! We will be dividing the gallery into sections, Animal, Vegetable, Mineral and 'Everything Else". So, put on Radiolab in one ear and watch your David Attenborough documentaries in the other and join us. I'd like to be in the Mineral or Everything Else category! We'll be listing the final group of artists for our show by February 17th on the blog and emailing more information out to everyone after that! The pieces will be listed on our online gallery, online shop and in our brick and mortar gallery and we shall all celebrate on opening night in Mid-April! More details about dates, deadlines and schedules and everything else will be sent to our final list of artists asap! This call for art is open to people from all over, so please feel free to tell your friends! If you have any questions about the theme or the call for art, please send us a note! And - special hint! We are just putting the finishing touches on a couple other calls for art soon, so keep an eye out!